Shonya from Learning How Much I Don't Know selected The Pilgrim's Progress for us to read during the month of March. Below is what she had to share after reading this book. Each time I read or think about this book, something new stands out to me, probably due to what is going on in my life at the time. I was struck this time by the many distractions Satan uses to deflect our attention from the goal, especially as I had multiple distractions in my attempt to finish the story for Carrie's book club. Sometimes the distraction is obvious, like Apollyan. For me, these tend to be the easiest ones to resist. If only the devil always took this big, scary form we would always be able to recognize when we need to take up the whole armor of God. Other times the distraction is in the form of good things—people we love, ministries we believe in, items we use for daily survival. Like Christian, we must love God more than the family who won’t follow Him. And just as he bemoaned his misuse of the arbor saying “O that I should so indulge the flesh, as to use that rest for ease to my flesh, which the Lord of the Hill hath erected only for the relief of the spirit of Pilgrims” (48) so too must I bemoan my abuse of that which God intends for good when I am distracted with overindulgence of the flesh. Unfortunately, good things are too frequently twisted, including the gospel, resulting in false teachings that distract honest seekers from the Truth. Most of the time, however, the most effective distractions are birthed from within (James 1:14-15). It's my own selfishness, greed, and desire for instant gratification which, like Passion, entices me to value and pursue what I want right now rather than patiently waiting for the better end, the "glory which shall be revealed in us" (Romans 8:18). It is my own pride that distracts me from humbly receiving rebuke and correction and instead leads me to "bid him look to himself" (44), defensively seeking the speck in the other's eye. It is my own laziness that finds the "discoursing of things that are profitable" (80) more enjoyable than the actual fruit-producing application. (gulp) My selfishness, indeed my love for self, seeks an easier way--especially when I'm tired, discouraged, and long for a little break. I convince myself that surely this path in the meadow, "according to my wish is the easiest going"(116), and will lead me in the same direction I was headed. My lack of faith distracts me from the freedom I have in Christ by supporting a "weak and feeble mind, offended and made weak at that which others can bear" (278) resulting in fear and second-guessing my service to God. 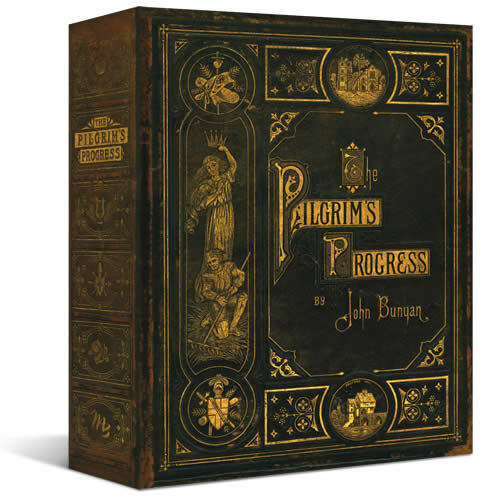 Did you read Pilgrim's Progress this month? If so, talk about it with us in the comments below. If you wrote up a blog post detailing your thoughts, please leave a link so that we can go and interact with you regarding your perspective on this story. 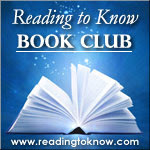 If you are planning to read along with the bookclub in April, it's time to pick out a P.G. Wodehouse title! Diary of an Autodidact is hosting the discussion. 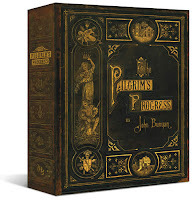 I was blessed to read Pilgrim's Progress early on in my Christian walk. And I read it about the same time that I started reading C.S. Lewis, J.R.R Tolkien and Sir Walter Scott. What spoke to me, because of my personal growth this last year, is how many trials and temptations we bring upon ourselves by our lack of remembrance which leads to a lack of faith! Somehow, like Christian, we forget that we are Children of God, that our purpose in life is to keep moving forward, towards the goal of glorifying our LORD! How simple it is to trust Him to guide our steps and keep us strong, yet because we are full of human emotion we thwart ourselves and allow worry and worldly thoughts to slip in and take root. I also noticed how welcome a fellow traveler was and how differently the Godly companion encouraged Christian onward versus the ungodly traveler who distracted and planted fear. One of my favorite exhortations is by Evangelist: "The crown is before you and it is an incorruptible one; so run that you may obtain it. Some there be that set out for this crown, and after they have gone far for it, another comes in and takes it from them. Hold fast therefore that you have; let no man take your crown....Let nothing that is on this side the other world get within you.."
Well. Um. I was so excited to read the adult version, having read a children's version when I taught 3rd grade. I wanted to read the original. Till I got it. I was about 30 pages in when I decided that I was SO distracted by some of it that I needed a modern version. I just picked up a modern version at my church library on Sunday...so I'm less than 1/2 way through. Forgive me. There is much to learn through this awesome book, and I will finish it. Just not by today. :) Thank you Shonya for choosing it! Oooh, I like Sky's thought of "a lack of remembrance which leads to a lack of faith." Reminds me of one of my favorite points from Douglas Wilson's "What I Learned in Narnia": "Remembering to obey is itself an essential part of obedience; you cannot separate the two" (89). Thanks for sharing those thoughts, Sky! And Annette, I think the reason "distractions" stood out to me so much this reading is that my March was FULL of distractions and I had a hard time finishing it on time myself! :) Good thing you still have plenty of time to finish and chew on this great book. Well, I also failed to finish the original due to distractions, but I am still reading Little PP to my girls. I'll try to remember to come back here and share my thoughts when I post them. What a neat idea for a readalong! I've never read this but I think I should someday!